Lots of people are going meatless these days. Whether it’s because they’re observing Lent or because they’ve jumped on board the Meatless Monday movement, they’re out there looking for alternatives to meat-centered dishes. 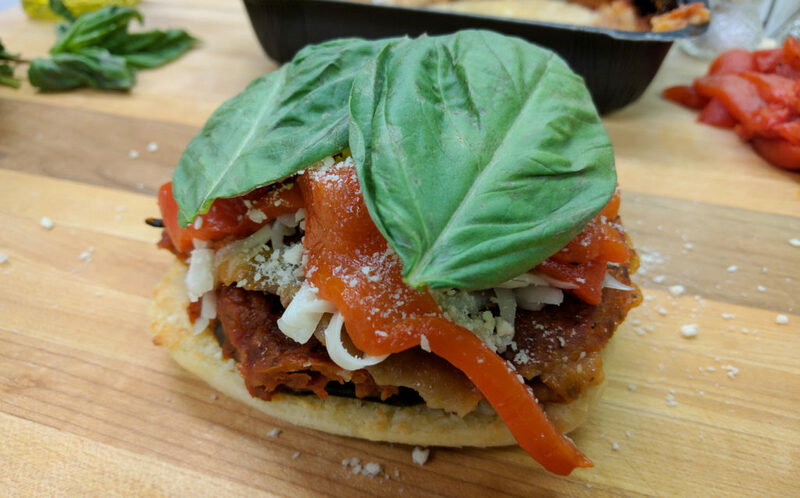 But meatless doesn’t mean tasteless and I’ve got a new, flavor-packed, meatless option you’re going to love! 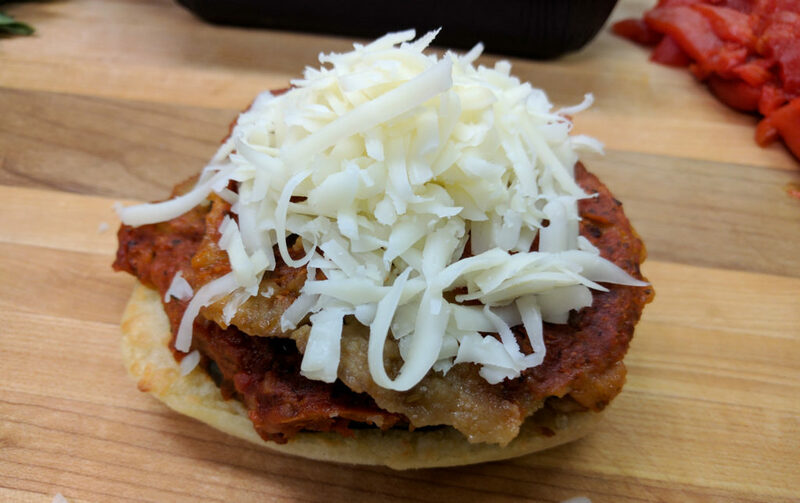 The secret can be found in our Eggplant Parmesan Sandwich! But…I’m getting ahead of myself. You may have noticed that there are a lot of deals going on in the freezer aisles of your grocery store this month. That’s because it’s National Frozen Food Month and companies are out there trying to make sure you’re checking out all the goodness that’s in those aisles, including all of the delicious ingredients you need to make your meatless meal days happen. Some of my favorite freezer case items just so happen to be vegetarian – frozen fruits and veggies, cheesy pierogies, fluffy dinner rolls, pizza, and…oh yeah, ice cream. There are even some great meatless dinner entrees! 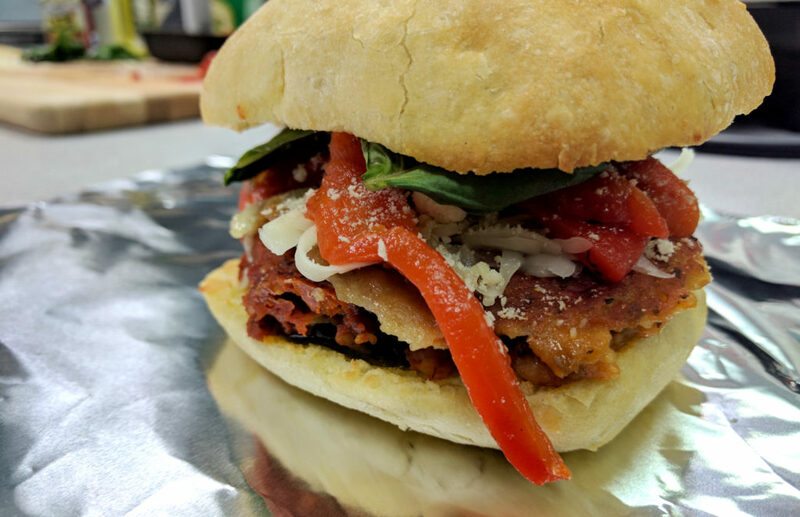 But today, I’m going to show you how to make this awesome Italian-style sandwich that’s totally meat-free and made with a couple of shortcuts from the freezer case. Step One: Get those ingredients! 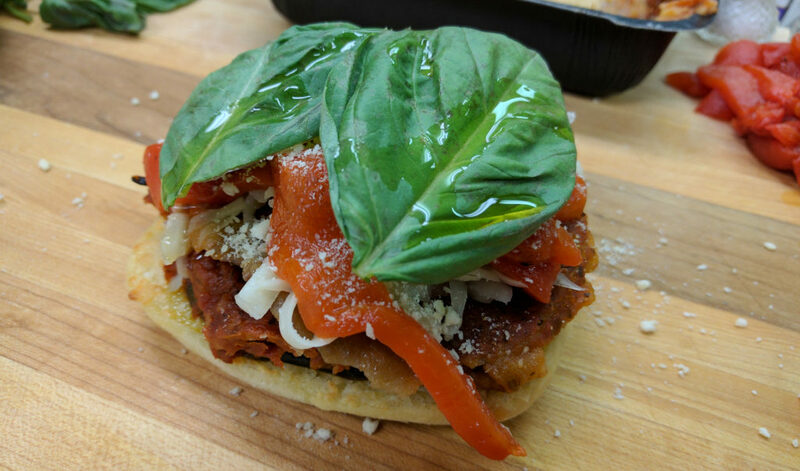 You’ll need a package of frozen eggplant parmigiana, frozen ciabatta rolls, shredded mozzarella cheese, roasted red peppers, Parmesan cheese, basil, olive oil, and salt and pepper (optional). 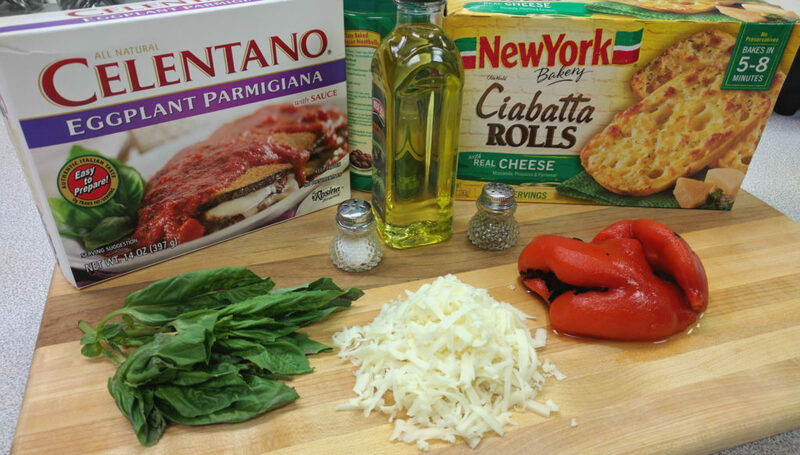 Step Three: Roll up those sleeves and let’s assemble your new favorite Italian sandwich. 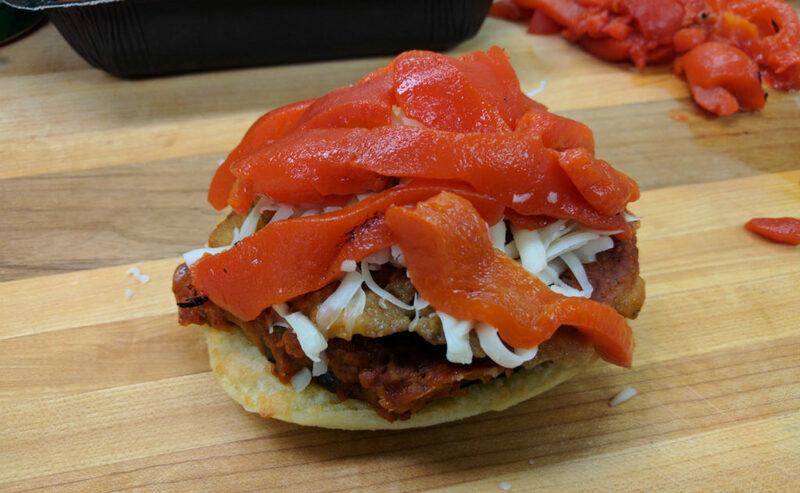 a) Use a fork to pick up two of the eggplant cutlets from the tray and lay them on the bottom half of your roll. Make sure you get some of that sauce on there! 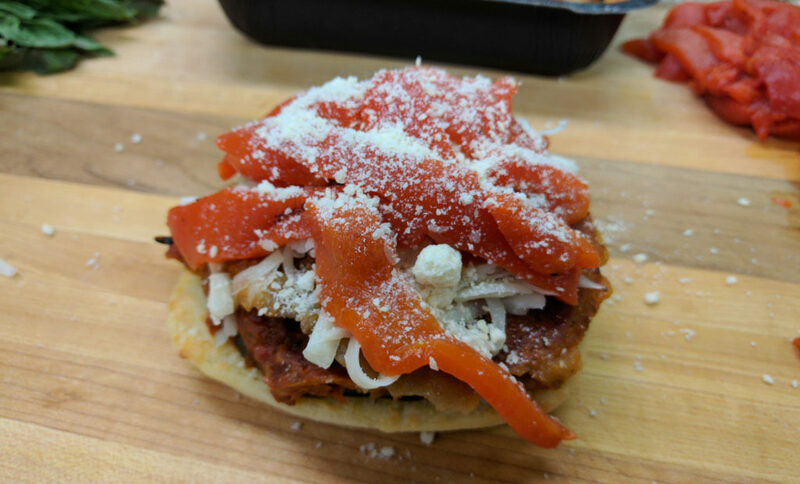 b) Pile on the mozzarella! Be generous if you like yours extra-cheesy. c) It’s time to add a little sweetness and even more flavor with roasted red peppers. d) Shake, shake, shake some Parmesan cheese over your sandwich. How much you put is totally up to you! e) A couple of basil leaves add a pop of color and some fresh Italian flair. I also like that they look like they’re sort of hugging my sandwich; keeping everything nice and cozy for me! f) Okay, we’re just about done. All that’s left is a drizzle of olive oil and a sprinkle of salt and pepper. 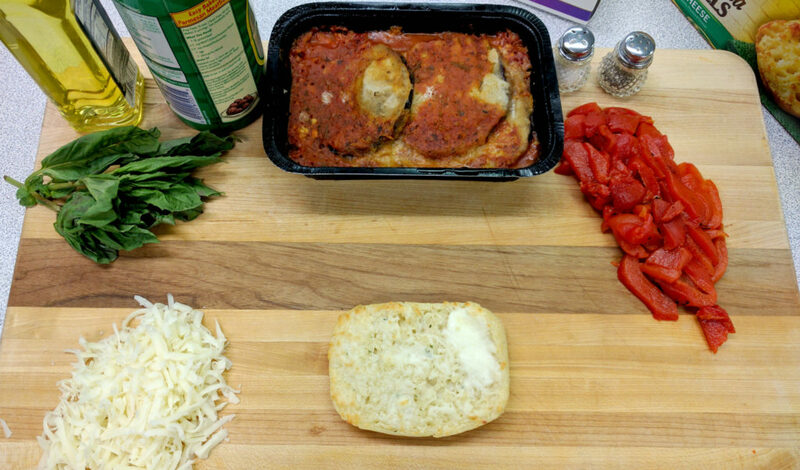 You can leave out the salt and pepper if you want, as the eggplant parmigiana is already seasoned. g) Put on the top bun! Step Four: Individually wrap your sandwiches (the recipe makes two!) in aluminum foil. I like to gently press down once they’re wrapped, so that they’re easy to grab. 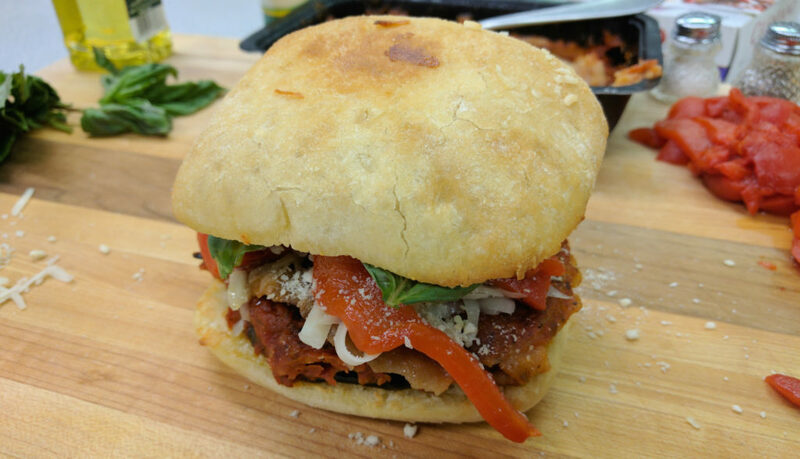 Hot, melty, meatless perfection that only took about 15 minutes! 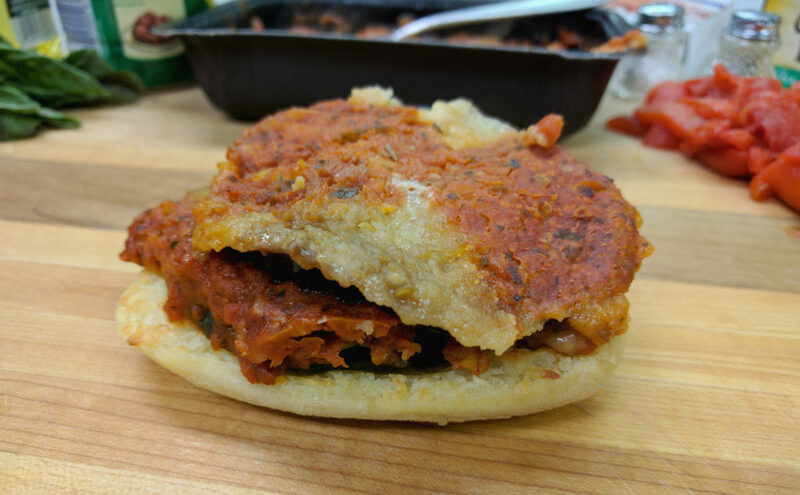 Click here for the full recipe for Eggplant Parmesan Sandwich. 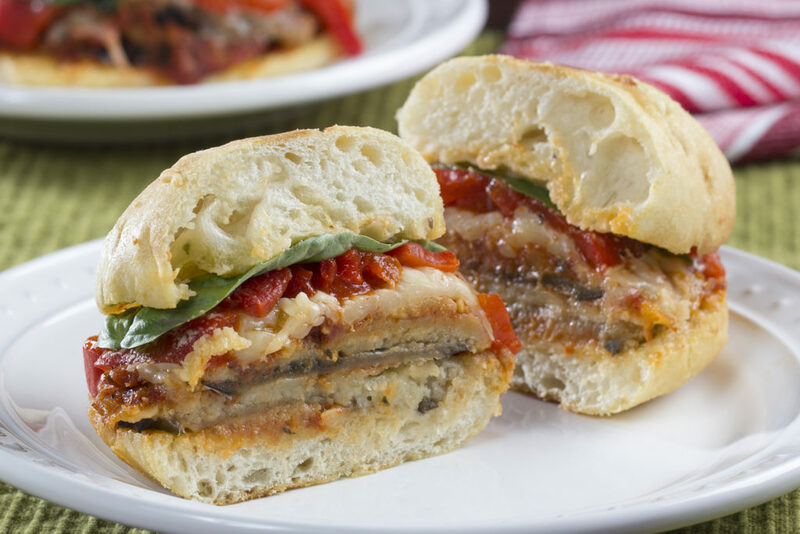 Another great thing about this Eggplant Parmesan Sandwich is that you can make these sandwiches ahead of time, wrap them up in foil, and keep them in the fridge until you’re ready to heat and eat. They’re easy to pack for lunch too. You might even get a few coworkers to join the meatless movement when they see what you’re eating! What’s your favorite meatless item from the freezer aisle?